This photograph features the new Opalessence™ fabric which contains mica, a naturally iridescent material. 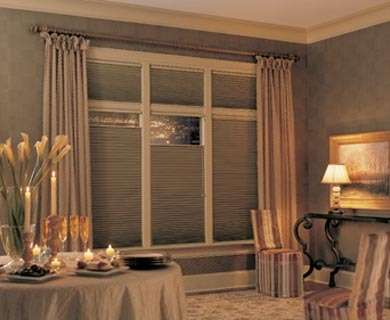 It's magical at night as your home's interior light picks up the subtle shimmer of the fabric. And by day, the fabric has a soft, mottled look, which diffuses sunlight beautifully. Featured here on the UltraGlide and PowerRise® lifting systems.